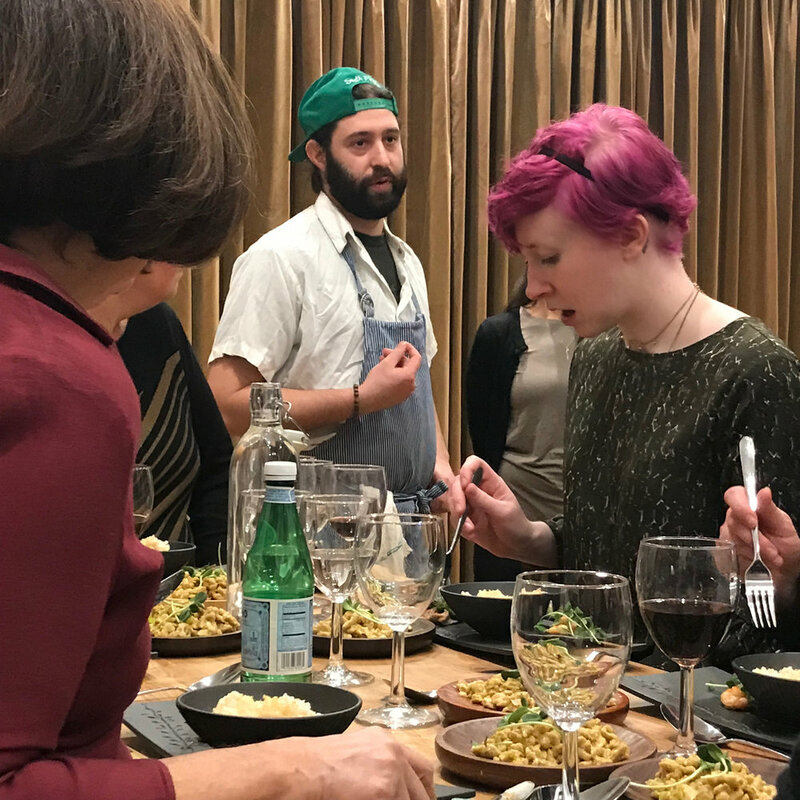 Our culinary events at Artifaqt Market debuted with chef and cheesemaker Sam Kennedy, along with his wife Stacey Kennedy and their assistant Matt Buddah. This evening was inspired from their recent travels throughout the Basque region of Spain. Using our serveware, they transported 24 guests to Spain for an evening of festivity. We had two seatings with 12 guests per seating. Tickets were $65 per guest. Sam Kennedy is a cheese maker from the picturesque region of Southern Chester County, with a focus on sustainable farming and grass-fed agriculture, he has successfully developed numerous award-winning cheeses. 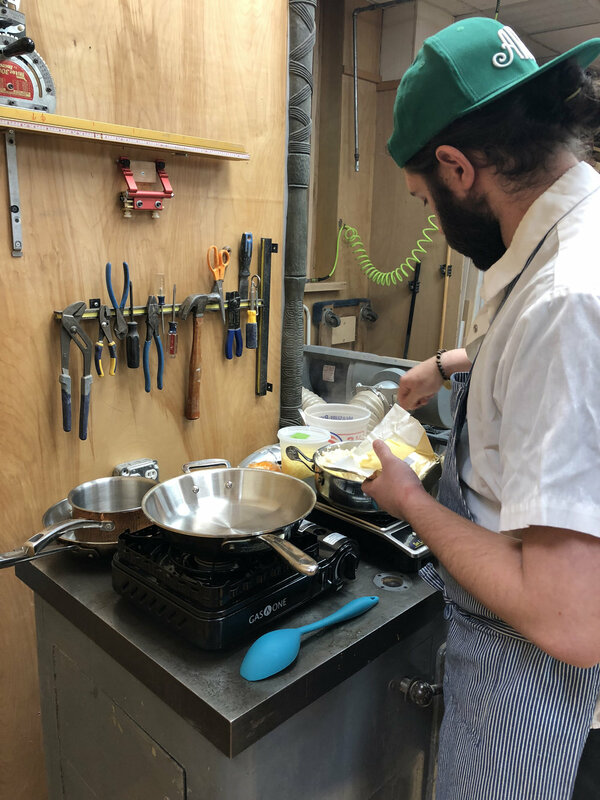 He uses his formal education in culinary arts and multiple years of experience as a chef to bring a style to cheese making that is uniquely his own. His travels have inspired him to pursue the study of regional food culture and local agricultural systems. While studying the culinary traditions and preservation techniques of many food regions he has developed a style that uses this depth of knowledge and sustainably grown local ingredients sourced seasonally whenever he steps into the kitchen. Matt Buddah is a cheesemonger and caterer from South Philadelphia. He has been working closely with our region’s finest farmers, producers, and chefs for almost 10 years. His travels through Spain and the Basque Country have inspired him to delve deeply into the culinary ethos of those regions—where cooking and eating seasonally and locally are not a novelty but a way of life. His goal of bringing the bounty of our region to the masses is about to culminate in a brick and mortar store called Liberty Kitchen in the Kensington neighborhood of Philadelphia. It’s All Gouda presented by Old City Cheese Co.